IMAGE: Above-ground entrances to the Bronx beer caves. Photo by blogger Ed García Conde. 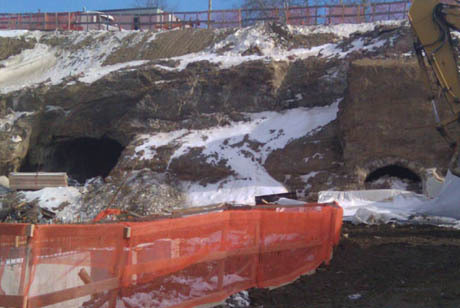 The Joy Construction Corporation, a developer building housing on the site, uncovered the caves in May, soon after construction began. 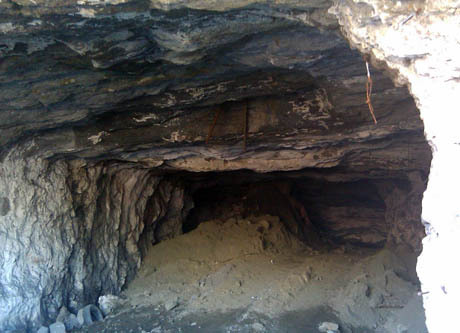 Work was replaced with wild speculation: Were the caves part of the Underground Railroad? Secret fallout shelters? 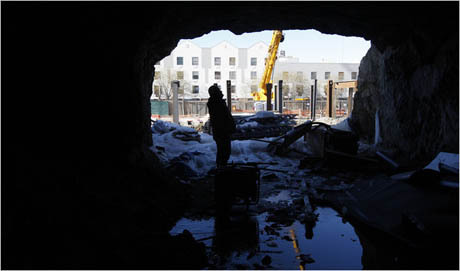 It took some research to confirm that an improbable answer was the right one: here in the South Bronx, less than two miles from Yankee Stadium, a network of old beer caves that had stood silent for generations. IMAGE: Inside the Ebling Caves. Photo by Ruth Fremson for the New York Times. 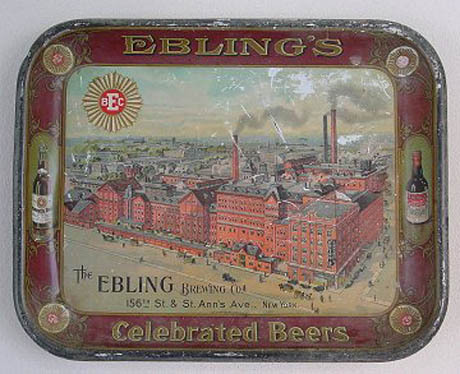 IMAGE: The Ebling Brewing Company, South Bronx, via Flickr user The Earl of Steinway. 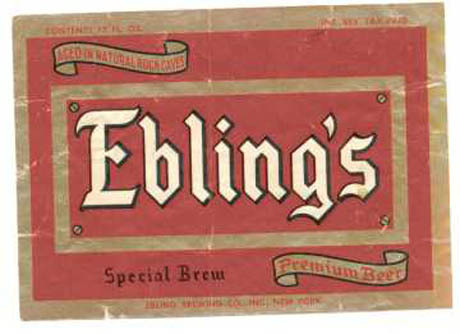 IMAGE: Ebling’s Special Brew label, complete with the promise “Aged in Natural Rock Caves,” via. 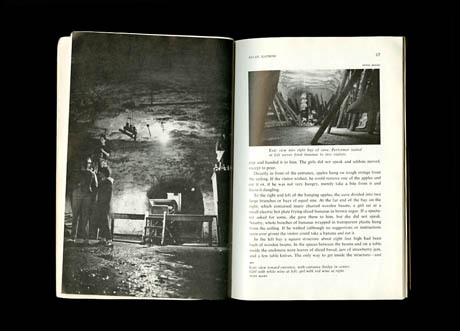 IMAGE: Looking inside the Ebling Caves. Photo by blogger Ed García Conde. There is no doubt that these dark, silent, subterranean ‘cathedrals’ are the ideal surroundings for secondary fermentation and maturation of wines and beers. It is further known that cold constant temperature between 50 and 55 degrees leads to great complexity. Ommegang ages its beer in natural limestone caverns in upstate New York, where the temperature is a constant 52º, while the manmade Ebling caves apparently rest at a slightly warmer 58º. Nonetheless, Ebling’s bottle maturation would presumably also have led to a “second fermentation,” which beer experts concur “produces a notable increase in carbonation, and a softer mouthfeel,” as well as the previously mentioned increase in complexity. 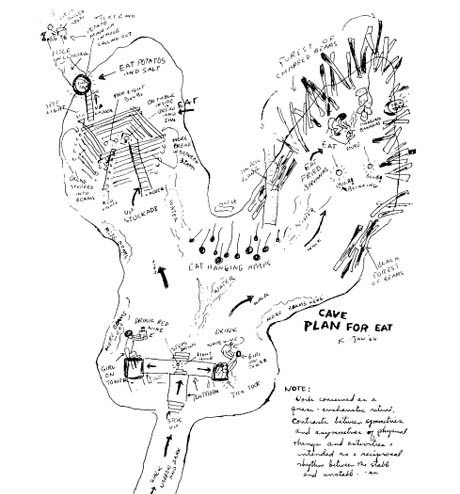 IMAGE: Allan Kaprow’s sketch for Eat, via. After entering an old building that fronted low cliffs, the visitor walked through several corridors and doorways and finally came to the Environment. The rock from which the caves were carved had been somewhat incompletely covered with white paint – the place had once been used by Ebling Brewery – and age and seeping water had created a sense of decay. Black charred wooden beams stood propped against the walls in several places. Here and there water collected in depressions in the floor and trickled in rivulets through the dirt. 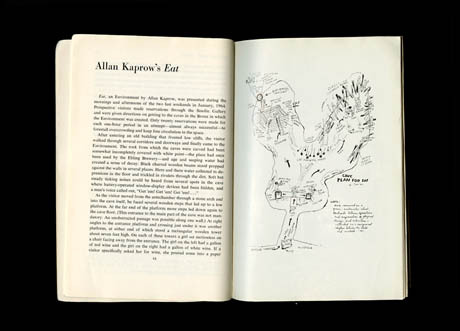 IMAGE: Spreads from Michael Kirby’s article about Allan Kaprow’s Eat in the Tulane Drama Review (Volume 10, Number 2, Winter, 1965), via the Design blog at the Walker Art Center. ‘Get ’em! Get ’em! Get ’em! …,’ he called out mechanically over and over, pausing occasionally for a while and then continuing again. If a visitor climbed the ladder, the man cut a piece of boiled potato, salted it, and gave it to him. 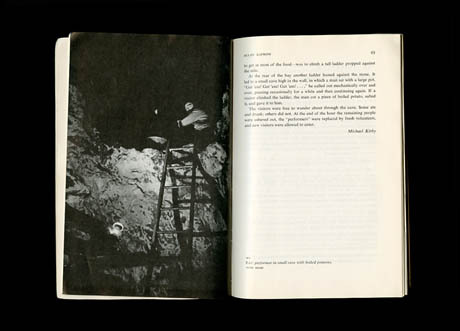 The visitors were free to wander through the cave. Some ate and drank; others did not. This seems a fittingly surreal postscript to Kaprow’s installation, if nothing else. Nonetheless, it’s disappointing that the caves cannot be re-used – whether to grow mushrooms, store cheese, or even age ultra-local Bronx moonshine. My mother told us when she first came to ny in 1930 that she worked in a factory over those caves and that every now and then the owner woild allow them to go down and look at those caves wow the history the bronx holds. In the 50’s and early 60’s I lived on Cauldwell Avenue and 156th Street, which was right around the corner from the Ebling Brewery. On that corner stood a beautiful Large Victorian house that the nuns of St. Peter and Paul RC Church lived in. I was told that the house once belonged to the Ebling family, and that there was a tunnel under the house that lead to the brewery, which I guess was built for the family’s convenience to get to the the brewery. This beautiful house no longer exists, and I often wondered if that tunnel was ever found? Although many beers today are aged on lees (bottle conditioned) this is not the same as the methode champagnoise. In the latter process, the wine (or beer) goes through a process called riddling, in order to removed the spent yeast from the bottle without filtering. There are very few breweries who actually go through this last step of the process (neither Allagash nor Ommegang do it, notwithstanding Allagash’s stating that they do on their website). Many lager brewers however do a cold-conditioning process in order to allow the yeast to clean up the byproducts of fermentation. Usually today it is done in temperature controlled tanks, although cave-aging is pretty traditional in the parts of Germany where lager brewing originated. Either way, it’s a cool article. It’s amazing the caves lasted as long as they did. Thanks for the correction, Adam! Also, I should point out that the moonshine I linked to is actually going to be made in Williamsburg – I was just suggesting that it would be even cooler to start a Bronx distillery, which could then use those caves. Thanks for the link to the Bronx moonshine! Missed that earlier this week.